The Care Quality Commission’s (CQC) State of Care report for 2017/18 has good and bad news for older people’s services in England. First the good news. Care for older people is generally of high quality. 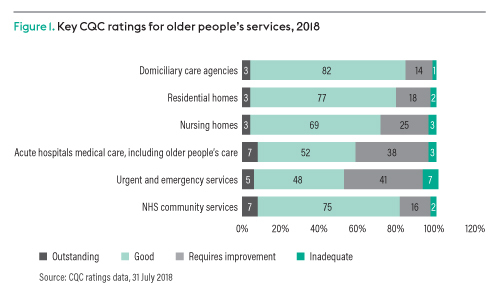 Whether it is in hospital, the community or across social care, most services are rated as ‘good’ (Figure 1). 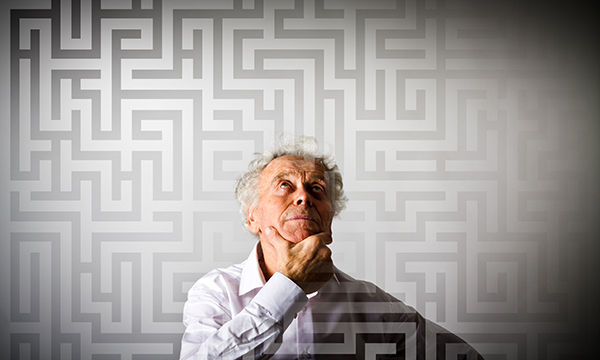 The bad news is that older people are finding it increasingly hard to access services. The CQC points to Age UK figures showing 1.4 million older people do not have access to the support and social care they need. In the past two years, the numbers have risen by almost 20%, with nearly one in seven older people now struggling. Meanwhile, satisfaction with GP services – often older people’s first point of call – has slumped to its lowest level in 35 years, while community services have been hit by staff reductions, particularly of nurses. The result has been a rising number of older people ending up in hospital. Data on preventable admissions, such as urinary tract infections, flu and angina, show the rate per 100,000 has been rising for all age groups over 65. RCN Emergency Care Association chair Janet Youd says it is clear older people are ending up in the wrong place. She says older patients, particularly those with dementia, are vulnerable in such situations. Ms Youd says hospitals have responded by investing in frailty units to provide expert care to the most vulnerable patients. As well as improving patient experience, these units have also helped reduce the number of delayed discharges, she says. But the drive to tackle delayed discharges – a government priority – has also taken its toll, according to the CQC. The report warns attempts to prevent delays has ‘almost overwhelmed other priorities’, leading in some cases to safety being compromised. These include people being moved out of care settings before equipment, medicine or transport are in place for them to return home. It also says the lack of seven-day services outside hospitals is still a problem. The CQC cites staffing levels as a main reason for this. While the number of hospital nurses has been rising, the number of community matrons has fallen by 40% in the past eight years, while district nurse numbers have dropped by 44%, according to the commission. The regulator also highlights vacancy rates in social care, where 12% of nursing posts are unfilled. The CQC report suggests some people have problems navigating the system because they find services ‘complicated and confusing’. However, it also points to several examples of good practice where integration is creating seamless services. These range from acute response teams, which bring together NHS and social care staff to respond to emergencies in the community, to integrated care hubs and social prescribing initiatives, which prevent loneliness and isolation. Mr Kilgore says there are plenty of examples of good practice, but that community services must ‘get better’ at measuring progress. ‘In hospitals we have benchmarks, such as the four-hour target, so we can see clearly what’s happening. We don’t have these in the community, which can make the case for investment harder. Eighteen months ago, Calderdale and Huddersfield Royal Infirmary set up a virtual frailty service to support its emergency department (ED). The team see everyone with frailty who comes into the ED and medical assessment unit. They carry out a comprehensive geriatric assessment, which covers medical, psychosocial and functional limitations, in order to develop a coordinated care plan. The team, which includes nurses, physiotherapists, occupational therapists, geriatricians, pharmacists and a discharge coordinator, meet twice a day to discuss cases. Community nurses and social care also take part by phone. Nurse consultant for older people Renee Comerford says the unit is helping to reduce admissions and length of stay. She says: ‘The risk is that patients present with, for example, urinary tract infections with delirium and we think they need to come into hospital. But they are much better at home. We work with families to educate them and help their relatives. Wakefield council and local clinical commissioning group (CCG) has set up an integrated care hub to relieve pressure on hospitals and GPs. The hub allows GPs to ring one number or complete one e-referral form for each person with multiple needs. The person is then referred to the hub, which includes nurses, occupational therapists, physiotherapists, social care staff and a mental health worker. In addition, a mixed team of health and social care coordinators sit together in one office and triage referrals. In the past six months, the hub has seen nearly 2,000 people. Community matrons carry out immediate home visits where cases are flagged as urgent – it is estimated this has saved at least 400 emergency admissions.